When Hope and her aunt move to small-town Wisconsin to take over the local diner, Hope’s not sure what to expect. But what they find is that the owner, G.T., isn’t quite ready to give up yet – in fact, he’s decided to run for mayor against a corrupt candidate. 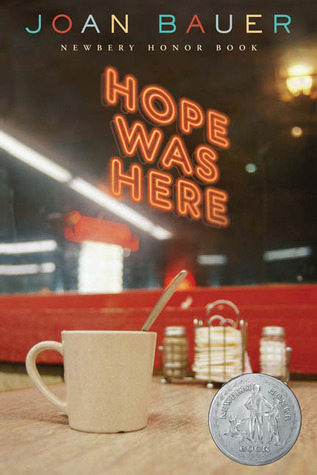 And as Hope starts to make her place at the diner, she also finds herself caught up in G.T.’s campaign – particularly his visions for the future. After all, as G.T. points out, everyone can use a little hope to help get through the tough times… even Hope herself. This book helped to teach a lot about two very specific fields to the reader – being a waitress and working in politics. And yea, you probably don’t think the two go together – I certainly didn’t. But in this book, Bauer made them click as though they are one in the same. The writing style was perfect for this book. It’s jumpy, but not in a bad way. A good chunk of the book takes place in a restaurant – a place full of hustle and fast paced moments between the staff and the customer. This book does a great job of giving that feeling to the reader, jumping between conversations from table to table to staff to table. It all flowed seamlessly and it’s wonderful. The political side to this book isn’t what you think – there was no arguing over political parties or anything like that. It was more what kids can do for a small town mayoral election and how it gets kids involved in what they can do for their community when they can’t actually choose their leaders. I have to say this book took me by complete surprise. I read other books by Bauer and didn’t love them a quarter as much as I loved this one. Definitely a great read! I loved this book and I definitely recommend it!